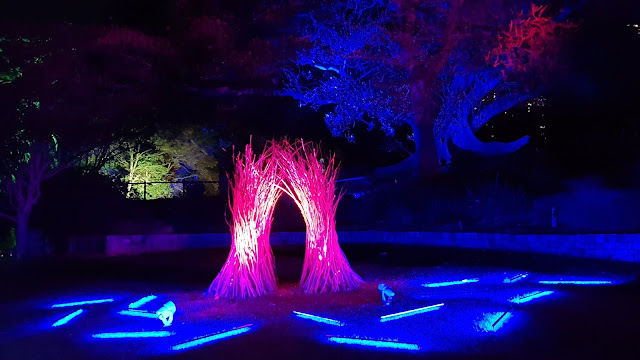 "The Bower" is an artwork installed in the Royal Botanic Gardens, as part of the Vivid Sydney festival, which ran from 25 May to 16 June, 2018. It was created by Australian Ruth McDermott and Ben Baxter, supported by Xenian Lighting. It is inspired by one of the great builders of the natural world, the Australian male satin bower bird who creates impressive structures surrounded by blue objects with the sole aim of attracting a mate. Linked to: Wordless Wednesday, Wonderful Wednesday, Wednesday Around The World, Floral Friday Foto. Peaceful comes to mind with this shot. Amazing, Thanks for sharing this helpful post. Beautiful. Thank you for sharing at Wonderful Wednesday Blog Hop. What a thrill it would be to visit this. Jackie, the exhibits in the Botanic Gardens were truly beautiful. Jim, fantastic find. Thank for sharing. I love the bower bird...and I love this amazing light sculpture! Awesome! What a wonderful tribute to an amazing bird! So colorful and enchanting! I loved the Botanic Gardens in Sydney. ...Sidney sure has some colorful treasures. Thanks Jim, for sharing, enjoy your week.